The Rosary is the story of the New Testament. Through the beads we follow the life of Mary and Jesus. We follow Mary from the day the Archangel Gabriel came to ask her to become the Mother of Christ, to the day she was crowned Queen of Heaven. We follow Jesus from the moment the Holy Spirit came down on Mary, through his childhood, his cruel death on the cross, the joy of Easter when he rose from the dead, to the day he ascended to Heaven in glory. What a story! And it is all true. Mary waits for your prayers. If you speak to her she always listens. She is our mother. When you pray the Rosary, begin by telling Mary what you would like her to use your prayers for - and then think about the stories that are hidden in the beads. The Rosary is such a tremendously powerful weapon against Satan, that armed with the Rosary in our hearts, and the beads in our hands, we can even stop wars. If we but knew how powerful this prayer is - we would never want to put the beads down. In October 2002 Pope John Paul II added the 'Mysteries of Light' to the Holy Rosary, calling us to pray the rosary daily; for our families - and for world peace. The Rosary is made up of "decades". A decade is one "Our Father" followed by ten "Hail Marys" and a "Glory Be". While it is usual to say five decades at a time, it is better to say one decade well, rather than five decades badly. Begin with the sign of the cross. Pray the "Apostles Creed" holding the crucifix and continue on the straight piece of the Rosary with one Our Father, three Hail Marys and a Glory Be, as shown in the picture. Then, to start the first decade, pray one Our Father. 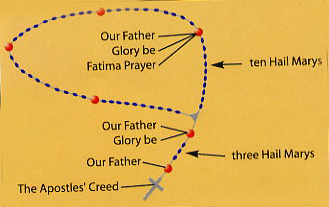 Moving on to the circular piece of the Rosary, continue with ten Hail Marys and finish the first decade with one Glory Be and the "Fatima Prayer". By saying five decades of the Rosary, you will complete one full circuit of the beads. To finish, after completing your chosen number of decades, pray the "Hail Holy Queen". The prayer to "St. Michael Archangel" and the "Memorare" are very powerful extra prayers. As you say each decade, think about a story in the life of Mary and Jesus. There are 20 stories to think about. Each story is called a "Mystery". On the next pages you will be able to follow the five "Joyful"mysteries, the "Mysteries of Light", the five "Sorrowful" and five "Glorious Mysteries".